InterPlay Web Applications can be installed on the provided Tomcat Webserver or on an external Web server (Tomcat or WebSphere). To satisfy your infrastructure constraints or for performance reasons, the Web Applications can be installed on different Web Servers. 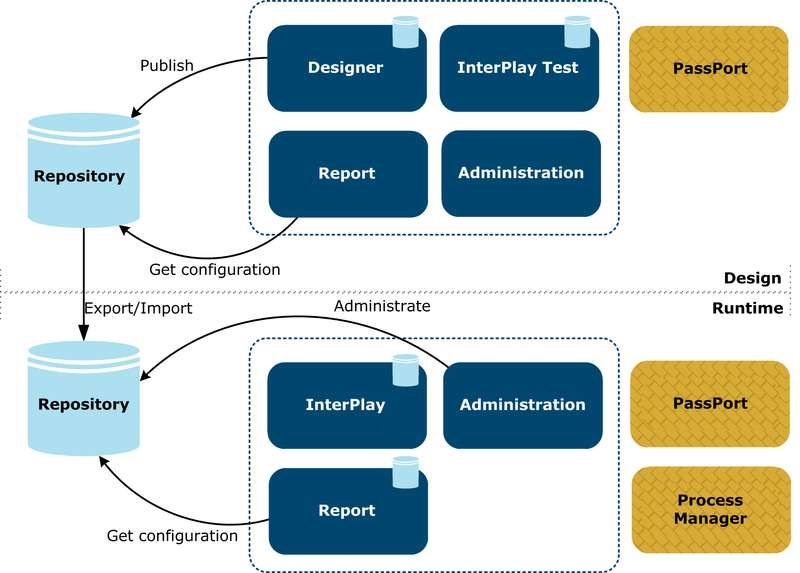 InterPlay components use separate database schemas that can be installed on the same database or in different databases. Databases can be installed on the same machine as the InterPlay Web applications or on another machine. The InterPlay user interface is based on Adobe Flex technology and requires Flash Player 10 or above to be installed on the client browser. InterPlay components connect to other Axway products as shown in the above table: PassPort. Installation is done via the Installer. Definition of an instance of a database and creation of tablespaces and user. For more information on the installation procedure and post-installation tasks, refer to the InterPlay Installation Guide.